Last summer, I spent some time in the tiny cowboy town of Dubois, Wyoming playing in the most amazing little bakery. I taught the baker about slab pie which is baked in a 15×10-inch pan. She taught me all about sourdough bread and homemade goat cheese. 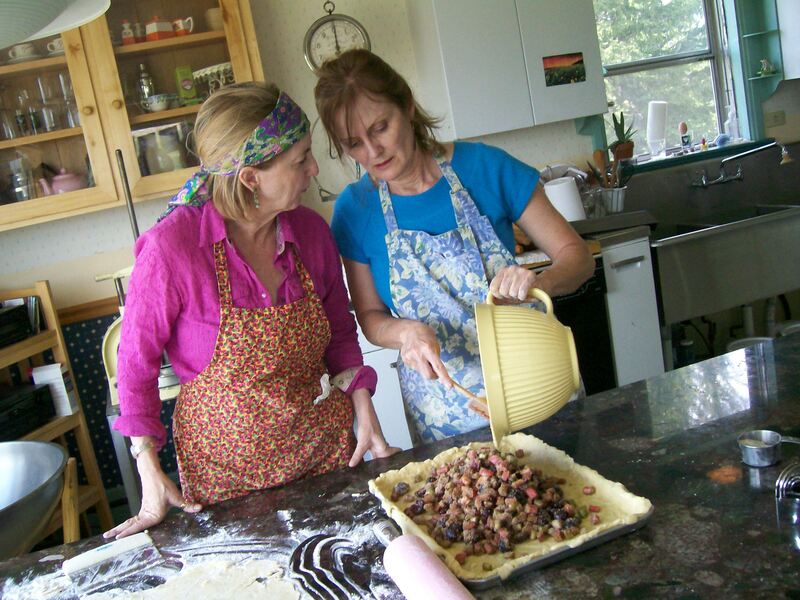 Fellow traveler, Michelle, and I (in photo) made Rhubarb-Bing Cherry slab pie because the rhubarb was ready to be picked and Michelle had just bought bing cherries at the market. The experiment was a success. Everybody loved them. Loved them. Good thing. We spent a long time creating these little masterpieces. This cake ball thing seems to be all the rage. You’ll find many a recipe by typing “cake balls” into your favorite search engine (google). You’re not getting our recipe. Well, maybe later. In the cookbook. Maybe. Haven’t decided yet. Here’s the typical generic recipe. Bake a cake from a cake mix. Crumble up the finished cake (what?) and stir in a can of frosting. (OMG…Frosting from a can? Shudder.) You end up with a glob of frosted cake mooshed together. Use a melon baller or mini ice-cream scoop to form balls. Dip the balls in melted candy coating. (Candy coating? Shudder.) Done. A heartbreak, for sure. Homemade cake, can of frosting, and candy coating? Teeth-achingly sweet with an artificial afterburn. Nonetheless, we liked the concept. Why not bring it into the kitchen and create our own homemade balls of wonder? We tried two versions: From- scratch Spice Cake with Cream Cheese Frosting rolled into mini balls and dipped into dark chocolate, then sprinkled with granola (Chocolate-Dipped Spice Cake Balls). Then we tried a from-scratch Dark Chocolate Cake with added mini chips. Fudge Frosting. Again, dipped in dark chocolate. Sprinkled with macadamia nuts. Our gourmet balls were not bad. The hungry hoards raved. (We brought them to a fundraising auction for a friend who needed help with her medical expenses.) Still a bit sweetish for us. But, we like our sweets on the subtle side. Oops. These crunchy, airy snacks were so good, I sampled a couple to make sure they were OK and then I couldn’t stop eating them. They were gone before I remembered I was going to take a picture. Take a bunch of kale. Cut the leaves away from the thick stem. Wash and pat dry (or send them whirling thru a salad spinner). Drizzle with a bit of olive oil and toss with sea salt and/or grated Parmesan cheese. Spread them on a baking sheet and pop them into a 350 degree oven for 8 to 10 minutes. Munch. Crunch. Crunch. And they’re gone.